This is the last recipe I made in the last few months from Jenis Signature Collection. I was really keen to make ice cream from cheese and I whilst I do not eat a lot of goats cheese, I do like its strong flavour when it is not over powering in a dish. 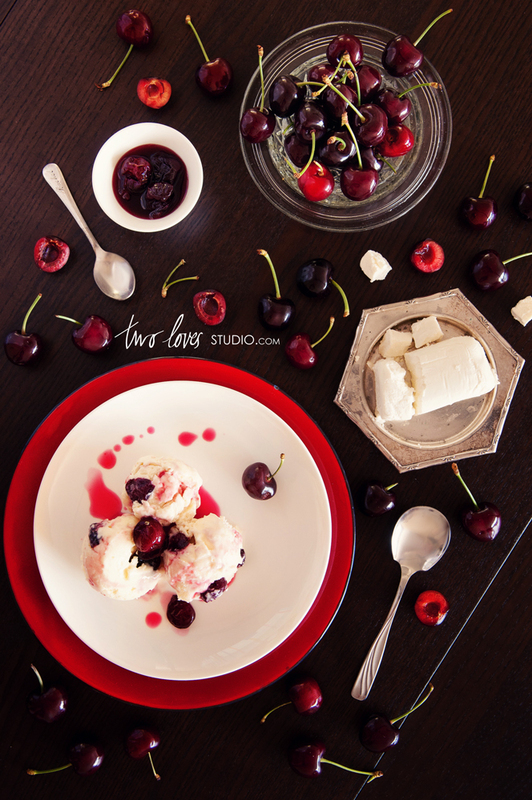 For those of you who are welcoming the warmer months when cherries will be in season, this is definitely one to try. 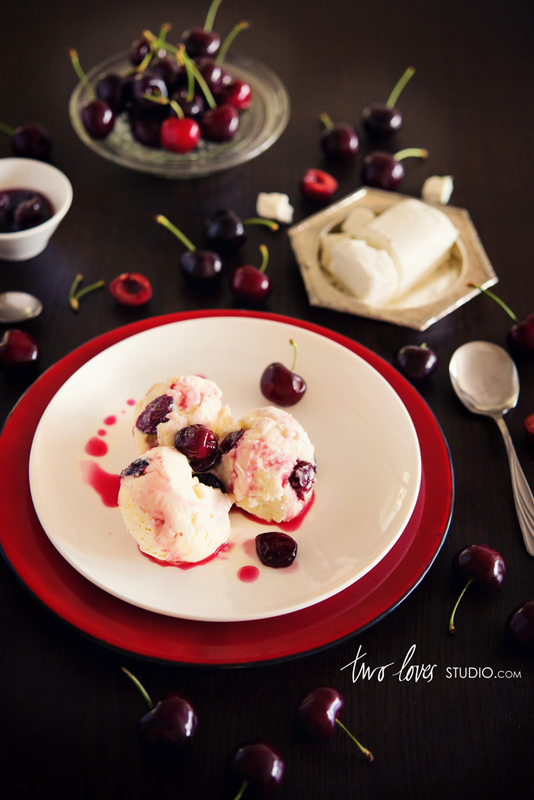 The sweet tartness of the cherries combined with the tangy goats cheese is reminiscent of a cherry cheesecake. To pit the fresh cherries, I used a clean beer or soda bottle and a chopstick. Place the cherry in the opening of the bottle and skewer the cherry with the chopstick. The pit will fall into the bottle, leaving the flesh intact on the bottles rim. You should be able to buy already pitted cherries if you are using frozen ones. Preheat the oven to 200 C (400 F). Combine the cherries, sugar and cornstarch in a baking dish and toss to coat. Roast for 30-45 minutes. stirring every 15 minutes until the juices are thickened and bubbly. Let the cherries cool completely and chill in the refrigerator. The cherries will need to be chilled before the ice cream is made. Mix two tablespoons of milk with the cornstarch in a small bowl to make a smooth slurry. Set aside. Whisk the goats cheese, cream cheese and salt in a separate bowl and set aside. Fill a large bowl with ice water. Combine the remaining milk, the cream, sugar and corn syrup in a large saucepan, bring to a roiling boil over a medium heat and boil for 4 minutes. Remove from the heat, and gradually whisk in the cornstarch slurry. Bring the mixture back to a boil over medium heat and cook until slightly thickened for about 1 minute. Remove from the heat. Gradually wish the hot milk mixture into the cheese mixture until smooth. Pour the mixture into a large ziplock bag and submerge into the ice water. Let cool for 30 minutes. (You can also leave in the fridge to cool for at least 4 hours). Pour the mixture into your ice cream machine and spin until thick and creamy following the directions for your specific machine. Pack the ice-cream into a large airtight, freezer safe container, alternating it with layers of the cherry mixture and ending in a cherry layer. Leave in the freezer for at least 4 hours to completely set. Great composition on these. Love your subtle DOF in the lower image. Now enough with the compliments I need to go back to feeling suitably sick after a day of easter eggs all of shapes n sizes. Yes I remember you are a depth of field kinda dude. I do like to get ‘painty’ with my food, but there is a thin line between looking awesome and forced. I am yet to master this. This was one of my better ones. I didn’t have one easter egg this year! Did you know I am a fully fledged Melbournian now? Keep being “painty” I say. Ye gads – living in Melbourne. Do you have a #1 coffee spot or hidden-away laneway bar fav yet? Sounds lovely. And looks quite lovely in your photos! Thanks Michelle – especially if you love cherries! Amazing composition I love the colors on this photo.